*Business View Magazine ran a lengthy piece on Southern’s sustainability efforts in its October edition. A variety of people from the Southern campus community were quoted in the story, including President Mary A. Papazian; Suzie Huminski, sustainability coordinator;Heather Stearns, recycling coordinator; Bob Sheeley, associate vice president for capital budgeting and facilities operations; and Susan Cusato, associate professor of the environment, geography and marine sciences. *Jack Mordente, veterans affairs administrator, was interviewed Oct. 29 on Channel 8regarding problems associated with the Veterans Administration delay of payments for veterans’ tuition and other obligations. *Jodie Gil, assistant professor of journalism, was interviewed Oct. 20 on WNPR radio’s (90.5 FM) “Where We Live” show regarding barriers to health care. The interview was based upon an article she wrote earlier this year on the effect that a lack of health care can have on children’s education. *The New Haven Register ran a front page story in its Oct. 18 edition about the early reaction to Southern becoming a tobacco-free campus. The university officially instituted a tobacco-free policy in August. *A Southern study that showed microbeads floating in New Haven Harbor was referred to during an Oct. 16 press conference called by U.S. Sen. Chris Murphy (D-Conn.). During the press conference, covered by several media, he advocated for a national ban on those microplastic substances, which are found in some face scrubbing products and some toothpastes. The study was conducted a few months ago by then SCSU student Peter Litwin andVincent Breslin, co-chairman of the SCSU Department of the Environment, Geography and Marine Studies. Vince offered his remarks during the press conference. The New Haven Register, Channel 8 and Channel 30 were among the media outlets that covered the press conference during its Oct. 16 newscasts. *Kelly Gunneson, a senior on the SCSU volleyball team, was featured in the Oct. 15 edition of the New Haven Register. The article talked about her return from an ACL injury, her success on the court and in the classroom, and her family roots at Southern. *The opening of the Academic Science and Laboratory Building generated media attention in advance of the Oct. 23 ribbon-cutting ceremony. The New Haven Register ran a story on Oct. 14 about the features of the new building. Two area business publications posted portions of a press release last week pertaining to the collaboration between Southern and PerkinElmer. The company has provided hi-tech instruments for the new science building. The Fairfield County Business Journal posted an article online on Oct. 15.article, which was posted last Thursday. The Hartford Business Journal posted an article on Oct. 14. *The Oct. 8 talk by former Major League Baseball Commissioner Fay Vincent garnered the attention of several media outlets. His talk was the focus of this year’s Dr. Joseph Panza Annual Sport Management Lecture. The New Haven Register, Hartford Courant and Meriden Record-Journal ran stories in the Oct. 9 editions of their newspapers. The lecture also was covered by Channel 61, which aired a story during an Oct. 9 newscast. *Chris Piscitelli, director of judicial affairs, was quoted in an online version of a Sports Illustratedstory that was posted Oct. 8. The article dealt with daily fantasy football and the low-stakes betting associated with it. Chris was quoted, as were a few Southern students. *Southern’s new high tech treadmill — designed to assess risk of injury in a person’s hips, knees and ankles – garnered media attention in an Oct. 2 story and video in the Waterbury Republican-American. Carrie MacMillan, a features reporter with the paper, wrote a first-person account of what it is like to be tested on the treadmill. She included comments from Bob Gregory, assistant professor of exercise science, who is in charge of the treadmill testing, as well as Marc Robertson, a physical therapist and an assistant professor of exercise science. *A summary of President Mary A. Papazian’s State of the University address was posted in the Oct. 1 online version of the Hartford Courant’s YourTowns section. Highlights from the address were also posted online on Oct. 3 as part of the New Haven Register’s Forum section. Two of the most ambitious projects ever undertaken by NASA — the human exploration of Mars and the search for Earth-like planets outside the solar system — will be the subject of a Nov. 16 forum at Southern. 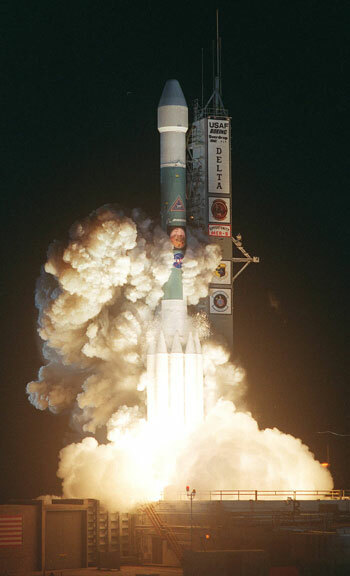 The program, “Missions Possible: A Manned Flight to Mars; Finding ‘New Earths’ in the Milky Way Galaxy,” is scheduled for 9:30 a.m. to 11:30 a.m. at SCSU’s Lyman Center for the Performing Arts. The event is free and open to the public. Steve Howell, project scientist for Kepler, will be the keynote speaker. Howell is involved in NASA educational outreach programs and specializes in research on variable and binary stars. He serves on many review panels and was most recently a member of the National Academy of Sciences panel on NASA’s Constellation system. Meanwhile, plans are being developed for a manned flight to Mars for some time in the next two decades. While a manned landing is challenging, the development of a reliable return flight is a more difficult technological hurdle. The colonization of the Red Planet is also being considered by some, but would require means to deal with the planet’s thin atmosphere, lack of oxygen and barren cold weather. Jennifer Stern, a space scientist for NASA at the Goddard Space Flight Center in Greenbelt, Maryland, will speak about the plausibility of human exploration of Mars, as well as what the recent discovery of water on the planet suggests for the possibility of life. She is a member of the science team for the Mars Science Laboratory Rover Curiosity, which landed on Mars in August 2012. Horch, a noted astrophysicist, has developed an instrument for the National Science Foundation that is used on telescopes to dramatically improve the clarity of cosmic images and has been used as part of the Kepler Mission. Fullmer is a veteran astronomer whose expertise includes understanding the weather on celestial bodies, such as Mars. And Boyajian is the lead author of a recent article published in a scientific journal about the lack of conclusive evidence that a natural cause was responsible for a dimming of light in front of a faraway star. It has led some – including many in the scientific community – to believe the dimming is caused by a superstructure orbiting around that star, perhaps created by an advanced alien civilization, though Boyajian said it is still only a longshot possibility. A question-and-answer period will conclude the program. The forum is being sponsored by the SCSU Office of Public Affairs. Last fall, SCSU organized a forum to mark the 50th anniversary of the fall of the Berlin Wall and featured keynote speaker Nicholas Burns, a former U.S. National Security Council member and diplomat. A program to analyze the impending 2014 mid-term elections also was held last fall. Other recent programs have included an examination of the situation in Ukraine in April 2014; a look at the Millennial and post-Millennial generations in October 2013; and a preview of the presidential and congressional elections in October 2012, featuring political journalist Erin McPike. Parking will be available in the Wintergreen Parking Garage on Wintergreen Avenue, next to the Moore Fieldhouse. For further information about the upcoming forum, please contact Joe Musante, the forum coordinator, at (203) 392-5073, or at musantej1@southernct.edu. For the first time in its 122-year history, Southern has an endowed chair. Ruth Eren – the director of SCSU’s Center of Excellence on Autism Spectrum Disorders and a noted expert in this field on program development for children – has been selected as the Goodwin Endowed Chair in Special Education. She was chosen after a national search. Eren, along with the late former interim dean of the School of Education James Granfield, co-created the Center in 2010 to help provide the state with a distinctive resource to improve the experiences of children who have been diagnosed with an autism spectrum disorder (ASD). She has spent many years consulting with public schools in Connecticut regarding program development for children with ASD and has been a member of several state committees related to this subject, including Connecticut’s Task Force for Children with Autism Spectrum Disorders. Eren is a former special education teacher and administrator, and currently serves as chairwoman of the SCSU Special Education Department. Louise Spear-Swerling, chairwoman of the search committee for the endowed chair, agreed. The endowed chair is being funded through a gift left by the late Dorothy Weisbauer Goodwin, who graduated from Southern in 1939, when it was named the New Haven State Teachers College. She died in 2009 at the age of 91. Upon her death, $1 million of the $1.2 million gift to the SCSU Foundation was earmarked for an endowed chair. Today, that endowment is worth nearly $1.6 million. About $180,000 is available initially, with additional allocations each year that are determined by SCSU Foundation policy and market conditions. The intent of the gift is to provide financial support for the position, including a reimbursement to the university of salary and benefit costs associated with the position; the hiring of research assistants working for the chair; and covering conference, travel, publication, research and other customary expenditures associated with an endowed chair. “I would like to use the endowment to support more SCSU student engagement in the Center and its activities, bring outstanding leaders in the field of education regarding ASD to our campus to share their knowledge with our students and community, and support efforts to increase our visibility and influence at state, national and international conferences,” Eren said. “Most important, the endowed chair will allow SCSU and the Center to enhance the lives of individuals with ASD by giving their teachers, related service providers and families, the evidenced-based tools that will help them all to achieve the goal of successful participation in society as adults,” she added. Hegedus said the chair is a major boost for SCSU. “We are confident that this will enhance the reputation and prestige of the Center and the university as a whole,” he said. Students engaged in scientific research at Southern now have a state-of-the-art facility and cutting-edge equipment that will better prepare them for the 21st century. A ribbon-cutting to mark the ceremonially opening of the university’s Academic Science and Laboratory Building was held Friday in front of SCSU’s students, faculty and staff, as well as local and state dignitaries, and business leaders. Katherine Perez, a physics major and New Haven Promise scholar, said the new building gives all STEM (science, technology, engineering and mathematics) students the opportunity to explore the many different scientific fields. Other speakers included Merle Harris, a member of the state Board of Regents for Higher Education; Steven Breese, SCSU dean of the School of Arts and Sciences; Ted Gresik, senior director, North America service, environmental health for PerkinElmer; Thomas Fleming, chairman of the SCSU Department of Earth Science; Kristin DeRosia-Banick, environmental analyst for the state Department of Agriculture, Bureau of Aquaculture; and Pasquale Salemi, deputy commissioner of the state Department of Construction Services. 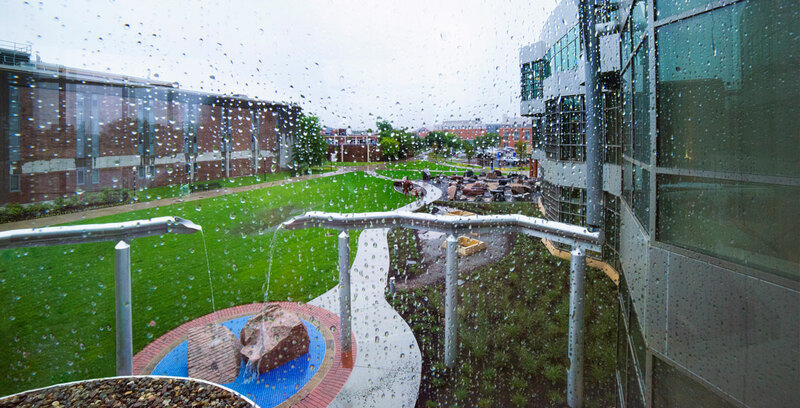 The “L-shaped” building features a brick and glass exterior, as well as a skywalk to Jennings. Academically, the building will host teaching and research labs for physics, earth science, environmental science, molecular biology and chemistry. It includes a high performance computing lab for research in theoretical physics, bioinformatics and computer science. 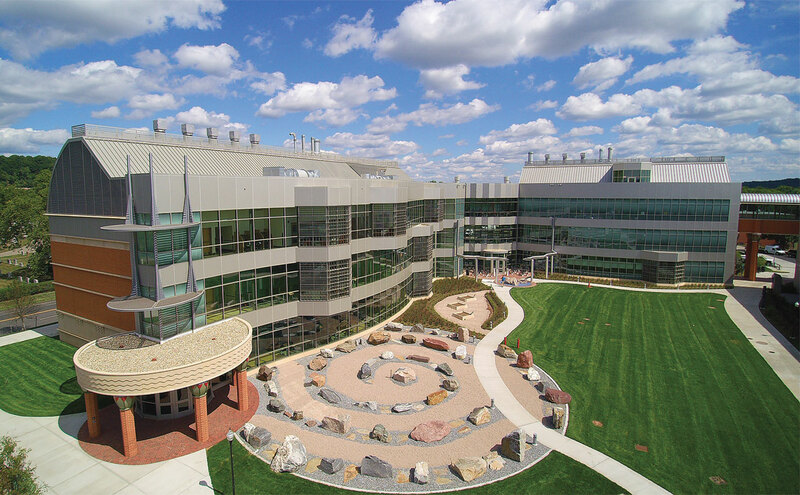 The Connecticut State Colleges & Universities (CSCU) Center for Nanotechnology is located on the ground floor. On the first floor, a saltwater Aquaria Room with a touch tank will be featured and will be a centerpiece of outreach to area schools and the community. In addition, a giant, model nanotube runs through the middle of the building and will light up dramatically as an additional attraction. The Werth Center for Marine and Coastal Studies is housed on the first and second floors. The center has several new labs, including an analytic lab (where mercury levels can be determined) and a sediment coastal science lab (where levels of sediment can be tested). Other amenities include an outdoor rock garden showcasing rocks indigenous to Connecticut; a sustainable rain harvester system that collects and stores up to 40,000 gallons of water underground, which later is dispersed to reduce landscape watering consumption by 50 percent; rooftop telescopes operated via the third floor Astronomy Room; a pair of 50-seat general purpose classrooms, as well as office space and study/common areas. Centerbrook Architect and Planners of Centerbrook is the architectural firm in change of the $49 million project. FIT Construction Inc. of Farmington is the contractor. 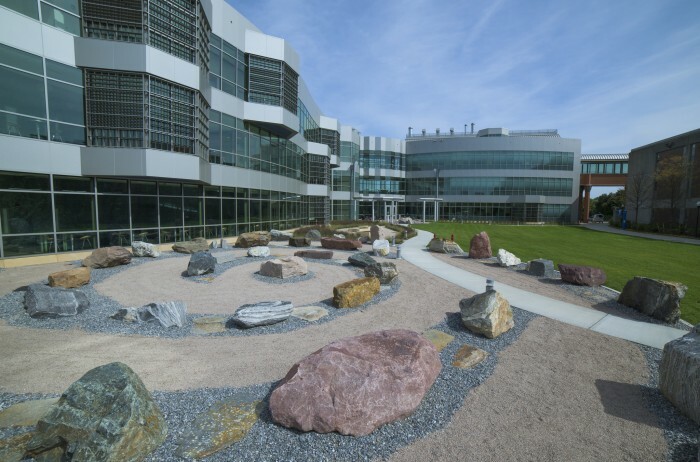 “This building is filled with awe-inspiring science with far reaching implications,” said Christine Broadbridge, SCSU director of STEM initiatives. Broadbridge announced that SCSU is naming its model carbon nanotube in honor of PerkinElmer in recognition of the company’s leadership participation during the initial outfitting of the labs and for its recent collaborative efforts with the university. 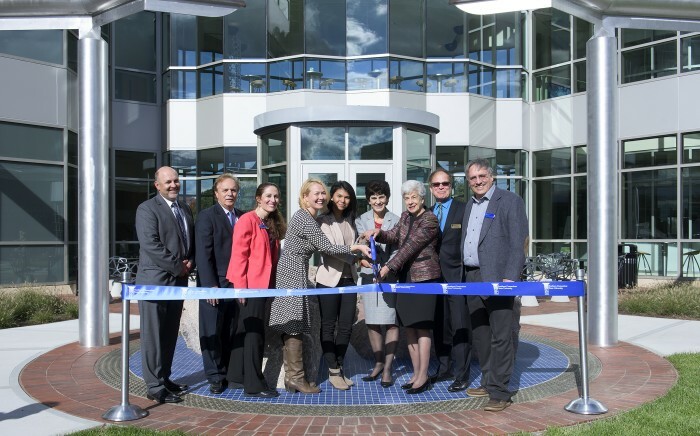 PerkinElmer, a company headquartered in Massachusetts with a facility in Shelton, Conn., and which delivers instruments and services designed to help improve human and environmental health, has installed hi-tech scientific laboratory instrumentation in the new building. Seven years ago, Elliott Horch finished the development of a telescopic appendage for the National Science Foundation that provided astronomers with stunningly crisp images of outer space. The instrument, called a Differential Speckle Survey Instrument (DSSI), has been used to learn more about binary star systems, and was even used by NASA’s Kepler Mission to look for Earth-like planets in the Milky Way Galaxy. And now the professor of physics at Southern is at it again – this time to produce a double-barrel telescope that would generate ultra-high resolutions with even more detailed information about celestial bodies. It’s called a portable multi-channel intensity interferometer. Horch says it’s essentially a two-telescope system, where the two scopes are set up far apart, but essentially look at the same target and function as one super telescope. The NSF awarded Horch a $300,000 grant to create this new telescope, which is expected to be completed in 2016. Horch says the primary use will be to look at bright, very close binary stars. Binary star systems feature two stars that revolve around each other. Many physicists, including Horch, believe the sun originally may have been a binary star. In essence, the new telescope would potentially help astronomers learn more about our own sun. “But we also want to use the new device to study the disks of nearby stars and potentially for exoplanet research,” he says. He notes that the telescope would enable astronomers to see distant stars the way we see the sun and the moon now – as round disks, rather than as points. The grant has enabled Horch to hire three Southern students – two undergraduates and a graduate student — to assist him with this project. In addition, the grant is providing SCSU with pieces of cutting-edge equipment being used in the university’s new Academic Science and Laboratory Building. The Human Genome Project has enabled people to learn about some of their medical predispositions, and is giving scientists a roadmap to discover disease cures and preventions. This development – the sequencing of human DNA — is ripe with the potential to do much good for humanity, according to Hyi-gyung “Clara” Kim, assistant professor of biology at Southern. But she quickly adds that it also carries risks for abuse and raises new ethical questions. It even poses personal questions about whether someone wants to know if they are predisposed to a particular illness, particularly if those assessments are considered precise barometers of lifetime risk. “The ethical, legal, and medical questions that will be generated in the years ahead with this technological development make it important for people to be aware of the potential personal and societal ramifications that are involved,” Kim says. As a result, she created a new course called “DNA as Destiny: Genetics and Society” that is being taught this fall. While only biology majors are taking the class during this semester, the university may open the class to non-science majors in the future. Will doctors and hospitals limit access to these personal genetic records, or will they disclose them to others? What are the ethics of trying to create designer babies by using the enhanced genetic information? Should insurance companies be made aware of someone’s genome so that it can adjust insurance rates, or not? Kim says society will have to address these and other moral and ethical questions. She says as a result of the Human Genome Project, completed more than a decade ago, a person’s risk can be accurately assessed for several physical diseases, such as with Huntington Disease, breast cancer and cystic fibrosis. The risk for other illnesses, such as heart disease and diabetes, cannot yet be predicted with the same accuracy, but that will likely change.